Barcelona may be on top of the La Liga table as usual, but this has been quite the bizarre season as far as the Spanish top flight is concerned, with teams like Abelardo Fernández’s Deportivo Alavés and Quique Setién’s Real Betis catching the eye with some impressive performances. 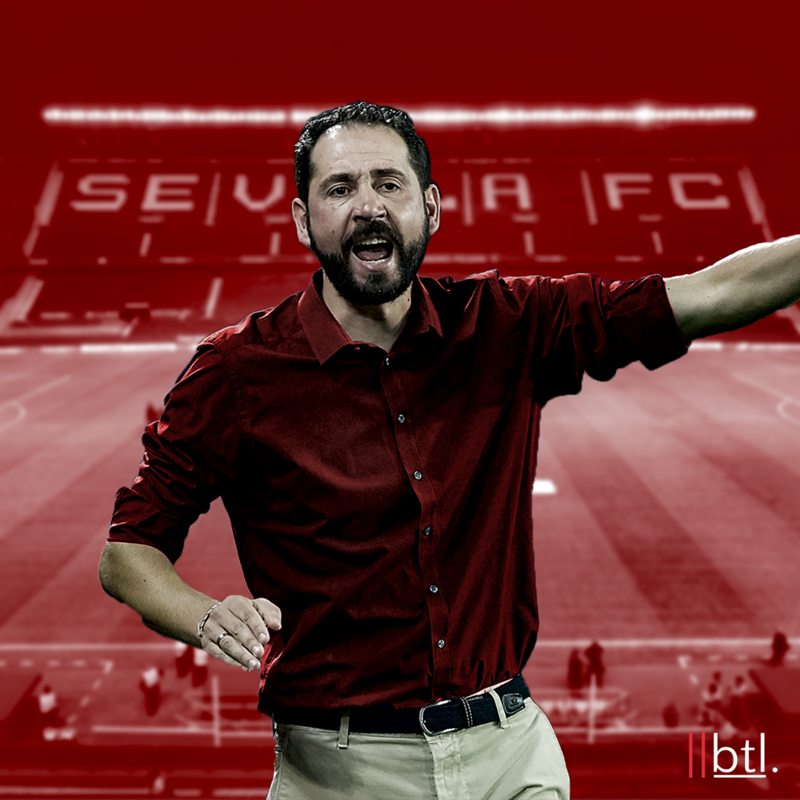 The pick of the lot however has been Pablo Machín’s Sevilla, whose unique tactical structure has rejuvenated the Andalusian outfit, with the team producing the kind of performances that fans were so used to under Unai Emery. Machín, who previously spent four seasons at Girona, has brought and implemented his system at the Ramón Sánchez-Pizjuán Stadium to stunning effect, with familiar names Wissam Ben Yedder, Pablo Sarabia, Éver Banega and Jesús Navas producing some top-notch performances as part of this new structure. This post seeks to understand Sevilla’s success by analysing the game plan that Machin has implemented at the club, as well as by looking at who have been the club’s most improved performers. Machín uses a 3-5-2 formation, which jibes in sharp contrast to the majority of formations in La Liga. This system is heavily centred around combinations in wide areas between the wing-backs, midfielders and strikers, all of whom have to work in conjunction to stretch opposition teams and fashion goal-scoring chances. While Machín relied on the graft and hard work of his players at Girona, falling back on a more conservative game plan in order to protect against the threat of relegation, the superior quality of Sevilla’s troops has seen him adopt a more attacking 3-4-2-1 formation, with Real Madrid Castilla product Pablo Sarabia playing the No. 10 role behind strikers André Silva and Wissam Ben Yedder. Behind Sarabia in midfield are Franco Vázquez or Roque Mesa, and Éver Banega, with the Argentine playmaker forming the base of the midfield and dictating play from his deep-lying position in front of the defence. The wingback spots are occupied by Sergio Escudero and Jesús Navas, with the former City man being an especially potent attacking weapon for Machín’s side. The side is completed by Machín’s well-known three-man defence comprising of centre-backs Simon Kjaer, Sergi Gómez and Daniel Carriço, all of whom have an equally important role in attacking as they do in defending. As is typical of 3-5-2 formations, the two wing-backs drop back to create a 5-man back line when Sevilla are defending, with Sarabia dropping to the right of Banega to create a 3-man midfield during the defensive phase of the game. The Spaniard, however, is always slightly ahead of the other two at any given point of time, given that his driving runs and dribbles are integral to the team’s counter-attacking play. When counter-attacking, the wing-backs storm forward while maintaining the width, which has the effect of dragging either the opposition midfielder or full back out of position. This creates space for either the advancing Sarabia or the retreating Ben Yedder to exploit, and if the opposition commits more numbers to either, then Silva will have more room to exploit. During counter-attacking, Sevilla rarely look to switch the play, with the idea being to attack as swiftly as possible using incisive vertical passes. This is why the wing-backs go high with Ben Yedder and Silva taking up positions inside the box, so that Sarabia can either dribble forward or pass it to one of the wing-backs for a cross. Oftentimes, the wingback on the opposite side of Sarabia comes inside to take up an interior winger position, so as to offer a central passing presence for Sarabia in addition to the ever-present Roque Mesa. When playing against defensive sides however, Sevilla have fewer opportunities for counter-attacking, and this is where the build-up phase of Machin’s system plays an important role. During the build-up phase, the three centre-backs have an important role in playing out of the back, as the wing-backs advance high up the pitch into wide positions to accompany the attacking midfielders. This leaves the defence and Banega to initiate the offensive component of Machín’s system, which is again unique in the way it is set up. The idea of Machín’s game plan is to provoke the opponent into pressing by playing deliberately risky passes, which Sevilla can afford to do given the quality of players like Banega, Sarabia and Navas. In playing these passes, they invite pressure from the opposing team, with the idea that once they commit their players to the press, space will open up behind the midfield line and in front of the opposition backline. Once space is opened up, the ball carrier (Banega) immediately plays a vertical pass to the offensive midfielders, who then lay the ball off to the wingback, who crosses the ball into the box. Alternatively, the wing-backs offer passing options as the midfielder looks to carry the ball forward, using passing triangles that are designed to resist the opposition press. One of the strikers will often drop deep to lay off a pass to the wing-back, with the effect that he switches positions with the offensive midfielder, who arrives into the box. Such movements make Sevilla incredibly hard to defend against, especially as Machín uses aggressive counter pressing to recover ball possession the moment it is lost. This forces opposition teams to boot the ball forward, which Sevilla’s centre backs soon retrieve and proceed to commence the same attacking pattern all over again until they wear down the defence. Machín’s system has had some major beneficiaries, with the most important among them being Jesús Navas and Pablo Sarabia. While Banega and Ben Yedder have also been superlative this season, their improvement and impact does not match that of the aforementioned duo, who have been rejuvenated by Machín’s unique game plan. Out of these two, Sarabia is the more elegant player, but it is 33-year-old Navas who has been truly exceptional in the wing-back role. The former City man’s pace, crossing ability and work rate makes him one of Machín’s most dangerous and dependable players, with his form being at such a level that the normally solid Atlético Madrid found themselves harassed by his attacking output in their recent 1-1 draw. The burst of acceleration that he puts on to escape pressure and storm forward with the ball is truly exhilarating to watch, as is his woefully underrated crossing ability. In addition, his ability to cut inside offers Sevilla a different dimension when the original system fails to work, and this versatility makes him an extremely dangerous player. With their unique tactics and effervescent attacking philosophy, Sevilla have been one of the teams to watch this season, though doubts persist as to its sustainability given the inevitable analysis by rival coaches that will follow. For now at least, we must enjoy the side that Machín has constructed, as Sevilla have introduced an element of unpredictability into the title race as well as in the Europa League. Given Barcelona’s resources and depth, they will surely lift the La Liga crown this year, but it is in Sevilla’s favourite stomping ground in the Europa that this team will truly come alive, especially after the recent elimination in the Copa Del Rey. It is only a mere matter of time before Machín’s genius is noticed by the wider footballing world, and the Spaniard seems well placed to take on challenges outside the confines of the La Liga.